Inside the Warren branch of Buddy’s Pizza. 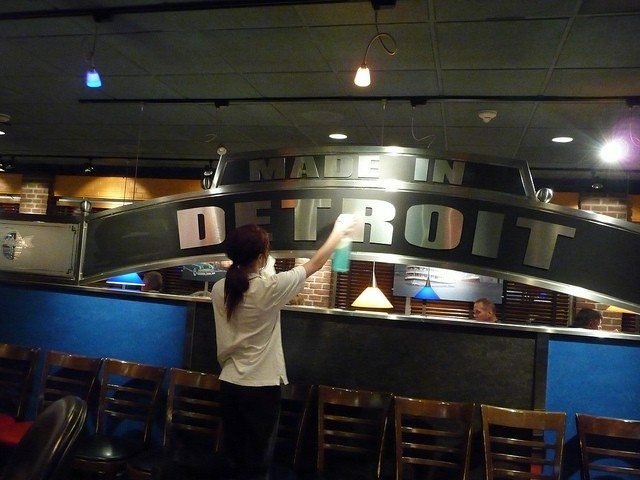 Detroit might not occur to you as a food destination; we’ve all seen the results of the economic downturn on the news. But Detroit actually has a thriving restaurant scene with more than 130 active restaurants in downtown alone. Made in Detroit still stands for something good. Detroit style pizza is served up on a crust that is twice baked in a square, well-oiled pan–the result is a fried/crunchy texture. This thick, deep-dish pizza is served with toppings such as pepperoni and olives and served with marinara sauce on the top. Buddy’s pizza was established in 1936 as a neighborhood tavern and also existed as a “blind pig”– an establishment which skirted state and federal prohibition laws and served booze. In 1946 they introduced the famous square pizza. Sixty-nine years later they are still going strong, with locations throughout the Detroit metro area. 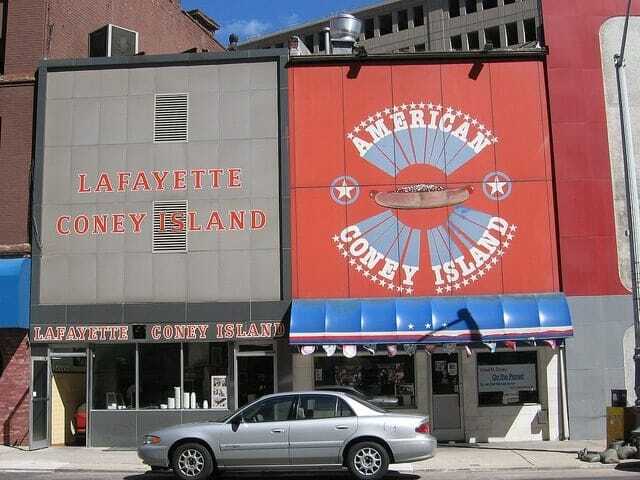 What makes the American and/or Lafayette Coney Island Hot Dog special?–a high-quality, specially-seasoned, natural casing hot dog, topped with a secret chili sauce developed by the Keros’ decades ago, diced white onions, and one or two stripes of yellow mustard, all served up on a fresh steamed bun. The original was developed by Greek immigrant brothers Bill and Gus Keros in 1914. The brothers got into a business dispute and in 1917 split the restaurant into the two establishments that exist today. I’m not going to get involved in the debate as to which of the two restaurants is better. 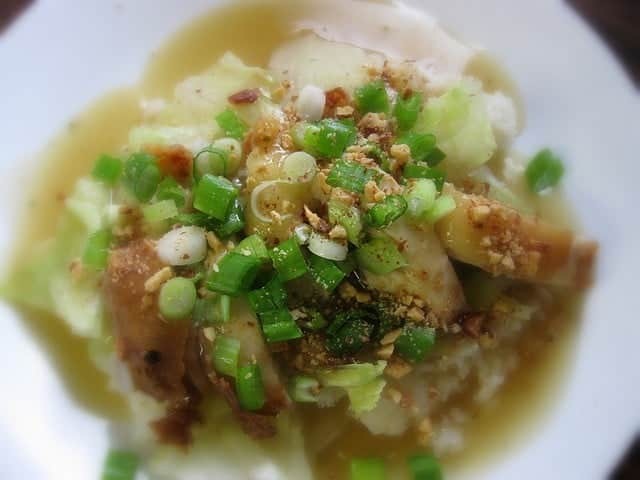 ABC is and American-Chinese dish that consists of battered and deep fried chicken breasts covered in a thick brown gravy with water chestnuts, bamboo shoots, celery and mushrooms, which is then topped with scallions and sliced almonds and served on a bed of shredded iceberg lettuce–which many say is there to soak up the grease. The Chin family opened Mon Jin Lau, “House of 10,000 Jewels,” in 1969. Marshall Chin, the third generation owner, keeps ABC on the menu and thinks of this not exactly gourmet food as old-school comfort food. Mon Jin Lau has been nationally lauded as one of the best restaurants in America. Gyros is meat roasted on a vertical spit and usually served on pita bread with tomato, onion, and tzatziki sauce. The outside of the meat is sliced vertically in thin crisp shavings. Detroit has had a large emigrant Greek population since the turn of the century. 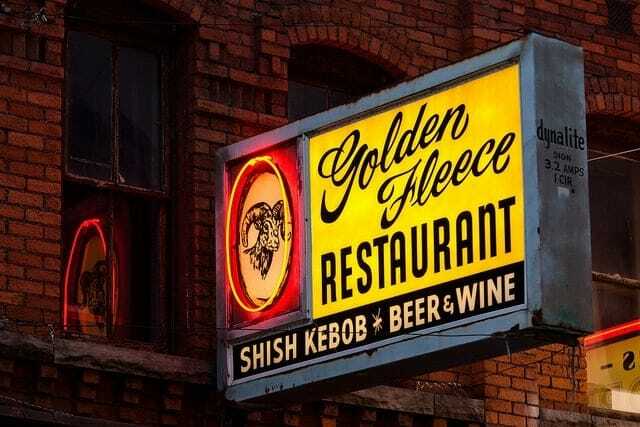 The Golden Fleece is known to locals the place in Greektown, Detroit to go for the most authentic food. They are not fancy, in fact some people have described the place as divey. But many Detroiters claim that this little hole in the wall, in operation for over 30 years, is the best place to go for Detroit gyros. Hygrade Deli has been in operation since 1955, operated since 1977 by current owner Stuart Litt. The dining room has the original red and white vinyl floor tiles and diner style furnishings. Their Reuben sandwiches are made with local Sy Ginsberg corned beef served up on crusty rye bread with melted Swiss cheese, sauerkraut and Thousand Island Dressing. Hygrade’s is a little bit off the beaten path, but well worth the trip according to Detroit reuben sandwich afficionados. Spread non-buttered sides with Thousand Island dressing. On 4 bread slices, layer 1 slice Swiss cheese, 2 slices corned beef, 1/4 cup sauerkraut and second slice of Swiss cheese. Grill sandwiches until both sides are golden brown, about 15 minutes per side. Don’t think the kiddies will go for the Reuben Sandwich? Don’t worry, enjoy yours and serve up one of these great recipes for kids: Octopus Shells and Cheese, Peanut Butter and Marshmallow Fluff Sandwich, or the Mini Taco Pizza. 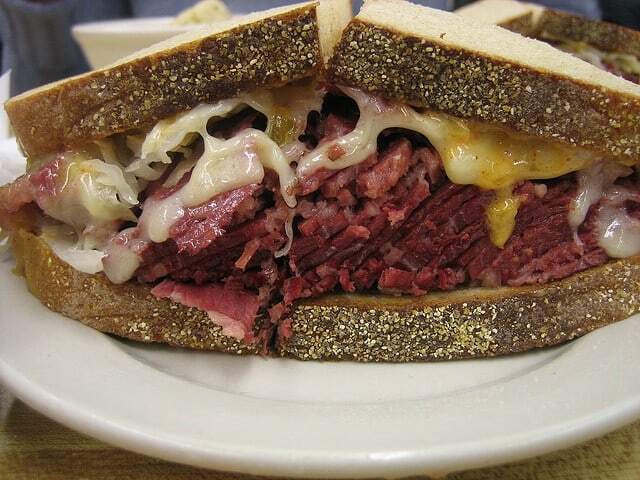 that Reuben sandwich looks divine!